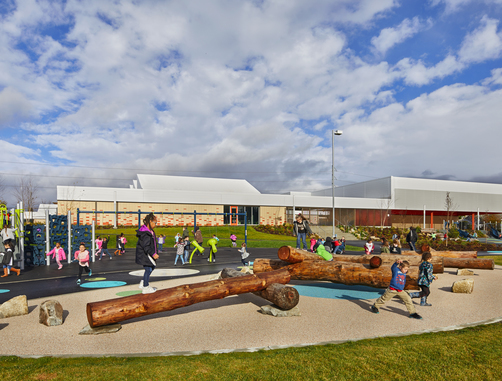 Developed through a collaborative, iterative process with Tacoma Public Schools, students, the community, and Mahlum Architects, Arlington Elementary’s revolutionary design was recognized at the Association for Learning Environment’s (A4LE) Pacific Northwest Regional Conference held in Seattle on May 2-4, 2018. Arlington Elementary earned the top regional honor, the Pinnacle Award, the top state award, the Polished Apple, as well as the People’s Choice Award which was voted on by conference attendees. AHBL provided landscape architecture and civil engineering services for the project. We are particularly proud of our work on the inclusive playground that was designed based on student input. We capitalized on the natural topography for play areas including a slide hill, rolling hill, boulder scramble and natural stone steps. There was a focus on inclusive play elements that provide a comfortable environment for all students. Passive areas are adjacent to active play to foster connection for students who aren’t comfortable jumping right into active play. This arrangement allows them to feel involved while still being within a defensible space. Unprogrammed spaces help to integrate play into everyday student life. To see more photos and learn more about this project, click here.